Enzyme immunoassay for the quantitative determination of free Etanercept (Enbrel®) in serum and plasma. 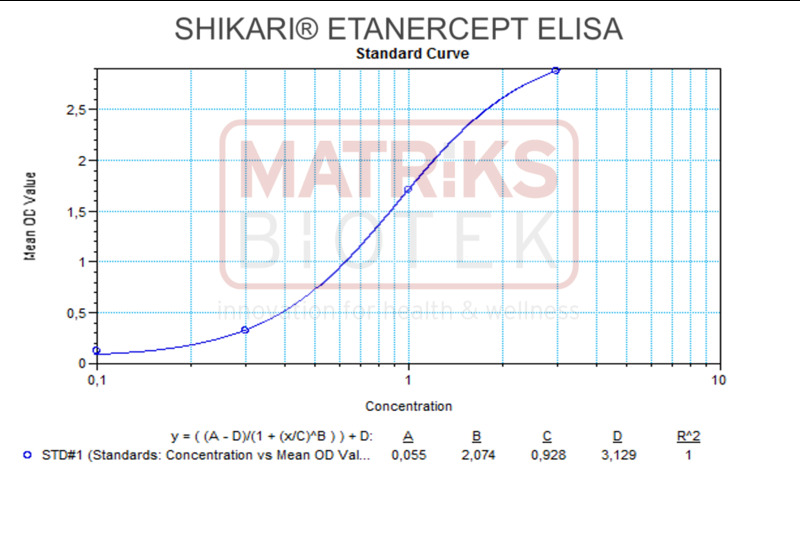 The Matriks Biotek Shikari Q-ETA ELISA has been especially developed for the quantitative analysis of free etanercept in serum and plasma samples. Enzyme immunoassay for the qualitative determination of antibodies to etanercept in serum and plasma. The Matriks Biotek Antibody to Etanercept ELISA Kit can be efficiently used for monitoring anti-Etanercept antibodies during therapy and offers the clinician a tool for decision on possible preventive measures such as possible addition of immunosuppressive drug to reduce anti-etanercept antibodies. # Jung Y et al., “Temperature-modulated noncovalent interaction controllable complex for the long-term delivery of etanercept to treat rheumatoid arthritis”, J. Control. Release 2013.